We had a dusting of snow last night and some hard frost, the snow is very little but the frost has the ice about an inch thick in watersplashes. The RAF have spent most of the day bashing it up!!! 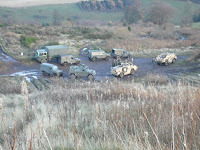 The picture shows Club members cars which have been left here for their use on the hill. The two blue/grey discos on the left of the picture have not moved for months and I would like the owners to take them away please. If they are still here in a few weeks time I will lift them with the JCB and put them across the road in the woodland. Winter brings out the Clubs!! 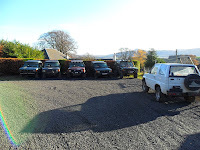 Hello, we have Tay 4x4 Club booked in for the 28th November and the Scottish Off Road Club on the 12th December. We are full on the 5th December and our own Club winch challenge is on the 19th December so it is all go up to Christmas. I only allow one visiting Club at a time now, this allows us to monitor what is going on and who is doing what, sadly necessary after a few items went walk about last year!! Our own Club has as usual picked up a few new members as the winter weather arrives and some previous members have rejoined, the site is brilliant at the moment. It is very wet and the water hazards are all full, we have had a lot of people using the site and mudding it up! 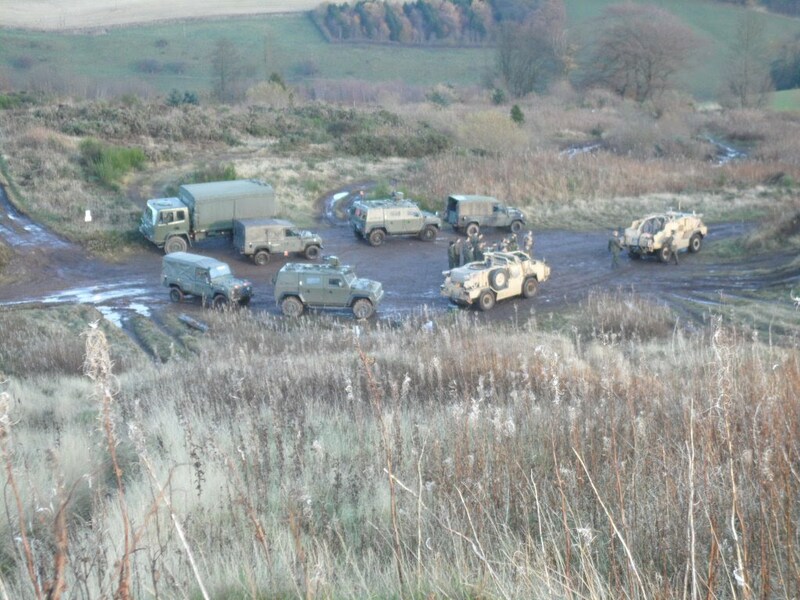 Pic is of the latest RAF group visiting for training pre deployment. Hope to see you covered in mud in the run up to christmas!!!!!!!!!! !